Here is another noteworthy auction - the sale of the collection of Paul Rousseau which took place in Toulon in March 2012. It is hard to find out much about Paul Rousseau; presumably this is NOT the sports journalist by that name who died in the same year, 1941. According to the auction notes he had notable contacts with collectors, men of letters and historians of the first half of the 20th century, notably Louis-Leon-Theodore Gosselin (1855), G Lenotre. 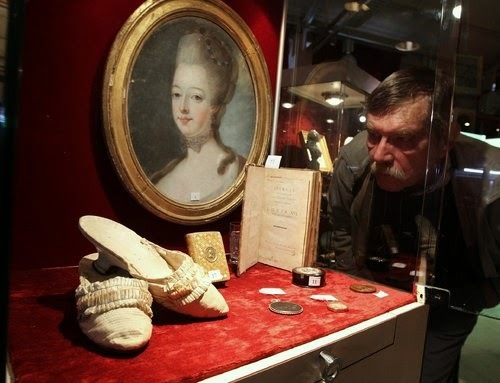 It was Lenotre who contributed the most significant items to the collection, notably a pair of mules belonging to Marie-Antoinette (no.68), a writing exercise from the Dauphin Louis-Joseph (no.56) and a piece of material from the furnishings of the Temple (no.71). Other items originated from the collection of Bernard Franck (1848-1924). On his death, Rousseau entrusted his collection to the Bordeaux lawyer Robert Dobin (1907-1997) whose family preserved it intact until 2012. 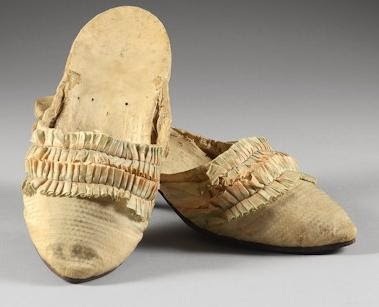 The sale caused a stir of interest in the press, largely because Marie-Antoinette's shoes sold for a record price of 43,225 € against an estimate of only 3-5,000 €. They were apparently bought by a Russian millionaire for his private museum in Moscow - no more details available. This single page writing exercise bears the signature "Louis dauphin". 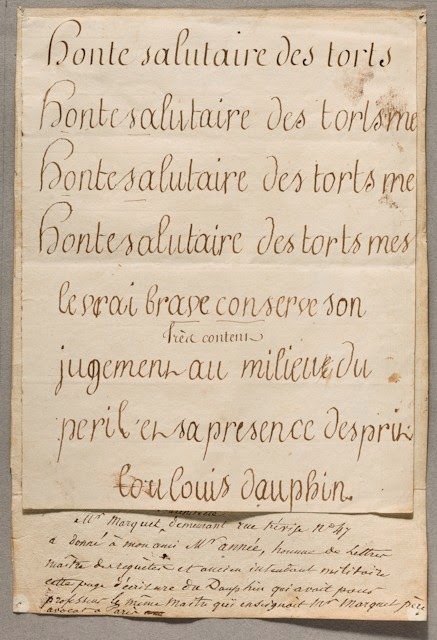 The tutor has written the model line "Honte salutaire des torts" which the Dauphin has copied three times. He has then added the phrase, "le vrai brave conserve son jugement au milieu du peril et sa presence d'esprit", which his tutor has annotated "Très content". The phrases are from a dictionary compiled by the abbé Jean-François Feraud. The note at the bottom of the page gives provenance, stating that the document originated with a Mr Marquet architect, whose father had had the same writing master as the Dauphin (named elsewhere as Dessalles). The Musée Carnavalet has a very similar 10-page exercise book. The piece made €19 500 but has worried experts who feel the writing is not that of Louis-Charles at all, but of his older brother Louis-Joseph; it was he who habitually signed himself "Louis dauphin" whilst the rare autographs of the future Louis XVII are all signed "Louis-Charles". 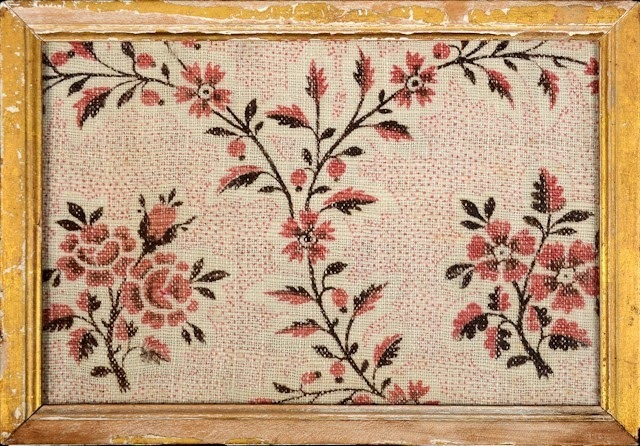 This fragment of floral upholstery, came from a bed in Madame Élisabeth's room in the Temple. A note on the back by Lenotre identifies the item as a gift from Madame Gustave Blavot, descendant of Jacques-Albert Barthélemy (1745-1813) archivist of the Order of the Knights of Malta and original owner of the Temple furnishings. Two other fragments, also at one time in the possession of Lenotre, formed lot 230 of the Alain Bancel sale of 21 May 2003. The major part of M.Barthélemy's bequest was given to the Musée Carnavalet by Madame Blavot in 1907. 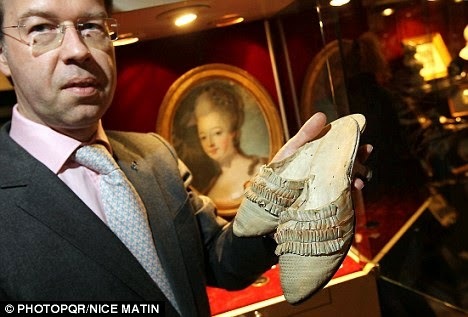 "Marie-Antoinette : ses mules rendent marteau", Le Figaro [online edition], 26/03/2012.